Two months after proposing a grand reform plan on its corporate governance, Hyundai Motor Group, the nation’s second-largest chaebol, came with yet another unexpected choice Monday, ditching the plan it previously hailed as a pathway to modernize the 50-year-old conglomerate. And its crown prince, the chairman’s only son, vowed that he would come back with “an improved” version. What the company need now is “the speedy and drastic reform and change,” the automaker’s Vice Chairman Chung Eui-sun stressed. “Without securing sufficient trust and support from shareholders and the market, no one can efficiently drive any restructuring plan,” said Chung in a written statement released Monday afternoon. The decision appears to have been made immediately after his trip to New York. The 48-year-old tycoon was in New York last week, reportedly meeting investors to convince them before holding a shareholders’ meeting on May 29. Throwing away the plan that may have taken years to prepare would have taken painstaking pluck, not to mention how it is unusual for a listed company to suddenly cancel a shareholders‘ meeting, experts say. “I think Vice Chairman Chung Eui-sun has made a very brave and rational decision,” said Bruce Lee, founder and CEO of Zebra Investment. “He may have learned about the hostile market sentiment over the reform plan by meeting investors in New York and knew that he won’t get the support he wanted from the National Pension Service,” he said. Now back at square one, Hyundai and its heir are preparing a plan B as the group faces wider attention and heavier burden to come up with a legitimate reform drive that satisfies investors, while also having to smooth out the leadership succession process. “He may start with expanding shareholder-friendly policies and even revise the merger ratio,” Lee of Zebra said. While Chung could review adopting the holding company structure, he may not do so in the method suggested by Elliott, which has demanded Hyundai Motor Company merge with Hyundai Mobis to become a holding company, while splitting with financial affiliates to sidestep regulations banning manufacturing firms from owning financial affiliates. 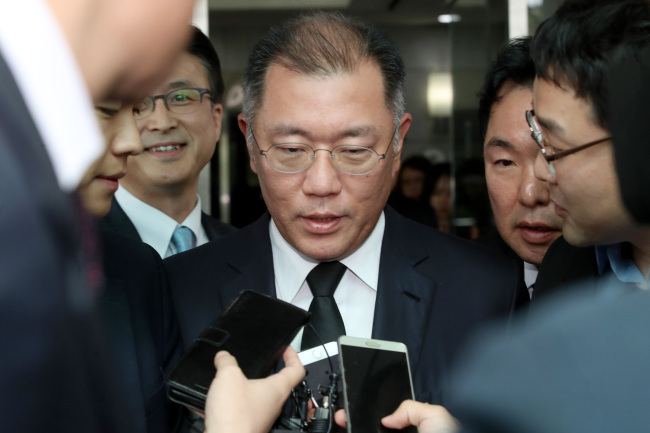 Adopting a holding company structure is an easy way for Hyundai, but it would cost a lot of money and time for the heir, according to experts. “To go with a holding company structure, Hyundai must ditch a financial entity. And to secure his leadership in the group, Chung may have to find massive capital source as the value of his shares in Hyundai Glovis won’t go up if not merging with any other lucrative businesses from Mobis,” said Park Ju-gun, CEO of CEO Score, a local corporate tracker. Chung holds 23.2 percent in Hyundai Glovis, a logistics arm of the carmaker. Hyundai previously proposed to spin off after sales and module units from Mobis, an auto parts maker, and merge them with Glovis. Elliott and proxy advisers including Glass Lewis, Institutional Shareholder Services, and Korea Corporate Governance Service, voiced opposition that such a plan would benefit the interest of the owner family, not the shareholders. Under time pressure, Hyundai could slightly revise the swap ratio, a not-so-favorable choice for Chung. “But uncertainty remains as Hyundai might not know how much would satisfy the market’s expectation,” Park said.